To participate in class or club fundraisers, or at Ho‘olaule‘a, parents must be food certified by completing the on-line Food Safety and Sanitation Training. The on-line training is a brief 10 minutes inclusive of a post test. Upon completion you will be food certified and this certification is valid for seven years. Should you need to check on the status of your certification or for questions., please contact Mandy Sensano/Operations at masensan@ksbe.edu 572-3226. Vice President Renee Segundo works in the County of Maui’s Planning Department as a Land Use and Building Plans Examiner. A memorable experience was Ho’olaule’a 2017 serving as a Silent Auction Co-Chair. Our committee took on the challenge to introduce online bidding. Silent Auction was very successful, we received good feedback from everyone, and we exceeded all of our goals. I serve to give back to Pauahi for all that she has given to our children. To be more involved in the planning and decision making for events, grants that PTSO sponsors. To provide assistance and support to our PTSO President and I hope that the 2017-2018 Board can make a difference. Secretary Jessica Cambra is a legal secretary with Carlsmith Ball LLP. She hopes to effectively assist with open communication and share information with all parents that are interested in their child’s activities and future. Treasurer U’ilani Walker-Baricuatro is a stay-at-home mom and a Thirty-One Gifts independent consultant. "One of my most memorable Kamehameha memories was the presentation of the kāhili at the Rite of Passage for my daughter Kamahie, KSM ‘19. As a member of the PTSO Board I hope to help build the bond of class of 2024 for all families." Jennifer McNeff is a Kamehameha Kapālama alumni and is the mother of one son who will be starting kindergarten this school year. She works at the County of Maui in the Highways Division and enjoys spending time with her family. She is excited and grateful to be a part of this new journey as a member of the Kamehameha Maui PTSO and to be involved with the other parents in making this an amazing year for our keiki. Tawnya Balmoja is a DIYer, crafty busy mom of one daughter, caretaker of two moms and P/T student pursuing her second AAS, this time in Health Information Technology – Medical Billing and Coding. She is a former Office Assistant from University of Hawaii Maui College Counseling Department of five years and UH System of combined total of nine years. After her daughter was born, she decided to take the role of a stay-at-home mom. When she’s not busy renovating/fixing her home, school, shuttling the ‘ohana between work, errands, doctor appointments, ballet, gymnastics and hula, she enjoys those quiet moments after a long exhausting day, catching a breath and sneaking in a cuddle/hug/kiss or two from loved ones. She is excited to be a part of this new journey and hopes that her involvement would help her daughter and the Kamehameha Schools ‘ohana, have an overall memorable experience throughout the year. Christina Camara is an active parent with two equally active boys. She is a school Social Worker for the Department of Education. Her weekends are spent watching her children play baseball, soccer, or swim. During her first year as a kindergarten parent she took on a leadership role by co-chairing the book fair. She genuinely enjoys being involved with school activities and is excited to take on the role of PTSO parent representative for the first grade class. Her hope is to serve & give back to KSM by supporting the keiki, staff, and fellow parents. Sanoe Kaneshiro is a busy mom of three, including twin boys, all attending school on Kamehameha campuses. When she isn’t busy shuttling kids between baseball, ballet, and cub scouts, she works as a case manager for Department of Health Services. Sanoe is happy to serve the first grade class as PTSO parent rep and is looking forward to being more involved on campus. She is most excited to continue building relationships with our Class of 2030 ʻOhana and giving back to this amazing community. Melanie Cook serves as a Staff Services Assistant for the County of Maui. She enjoys helping with excursions and assisting the students at the pool. She hopes that her active participation on the Board will allow her daughter to have the best school experience. Alisha Rego is an Operations Assistant for Island Plant Company and an Overnight Logistics Team Member at Target. I really enjoy attending my son’s school field trips & activities, soccer games as well as his piano/ukulele classes. We are truly blessed to be a part of this school and we look forward to seeing what is it come within the future years. Leinell Coloma-Nahooikaika is employed as a Clinical Specialist and Hawaiian Cultural Specialist in a home visiting program. A memorable KSM experience – celebrating her daughter Leiana’s KSM ’18 Rite of Passage with our beloved Poʻo Kula Lee Ann DeLima. Poʻo Kula’s speech and the ceremony were very moving and I literally got chicken skin! I serve on the PTSO Board to give back and to support the mission and values of KSM in raising up strong Hawaiian leaders for the future. Kahiwa Macanas serves as a VCM Specialist with Child and Family Services strengthening ‘ohana and fostering the healthy development of keiki. Memorable KSM experiences – daughter Kealaula's first day at Kindergarten and her speaking part at the Founder's Day program. I serve on the PTSO Board to stay connected and informed about KSM and I will keep the 2028 ‘ohana connected. We are a close class and everyone helps each other. We are #haumanastrong. Class of 2028, You ROCK!! Alicia Ginoza is the Controller at Mana Kai Maui Resort. She enjoys helping with class field trips and has co-chaired the class social and Hoʻolauleʻa committees. As a PTSO representative, she wants to keep families informed, get them involved with school events and be a voice for the parents' questions and concerns. Jerene DiPaola has been a KS Maui parent for 4 years. "I was a classroom teacher for 14 years and now serve as a Curriculum Coordinator at Makawao Elementary School. I enjoy watching my daughter Sara-Rose compete in her rodeo events and also watching her grow academically at KSM. As PTSO Representative, I hope to provide my manaʻo where I can and kōkua in the efforts of the KSM ʻOhana." Roselani Aiwohi is a parent of 2 KSM elementary students and 1 Kamehameha Preschool student. She is new to the PTSO but has served as Hoʻolauleʻa chair before. She is a teacher at Baldwin High School and enjoys supporting her keiki and their activities. Rosie looks forward to serving the "Class of 2026" during their last year as elementary students. Jan Kaaikala is a parent of 2 KSM elementary students, a 5th grader and a kindergartener. This is her first year serving on the PTSO board. She has volunteered several times to manage the craft table for the Book Fair ʻOhana Night. She is excited to work with other parents on helping the class of 2026 haumāna in the 2018-2019 school year. She works as a nurse case manager at Maui Memorial Medical Center and enjoys traveling and spending time with her ʻohana. Desiree Abernathy works as the office manager for the Tri Star Restaurant Group that includes Nick’s Fish Market Maui, Sarento’s on the Beach, Son’z Steakhouse and Manoli’s Pizza Company. A memorable experience was attending her first May Day program in 2015 (Sofia was in the third grade). "It was such a wonderful feeling seeing all the keiki dressed so beautifully, watching their dances and hearing them sing so beautifully together. You could feel all the work and love put into that day. Brings tears of joy to my eyes when I think about it. On a school wide level - to do my part in helping to make the entire Kamehameha experience memorable for both the students and their ‘ohana. On a 5th grade level - to encourage more bonding amongst parents and students; to gain more parent support for all our keiki through events, outings and socials for their last year of elementary school and beyond." Brenda Braun is a returning PTSO representative, having served for both Class of 2021, and Class of 2025. She enjoys being an active parent volunteer and has served on many committees over the last 11 years. 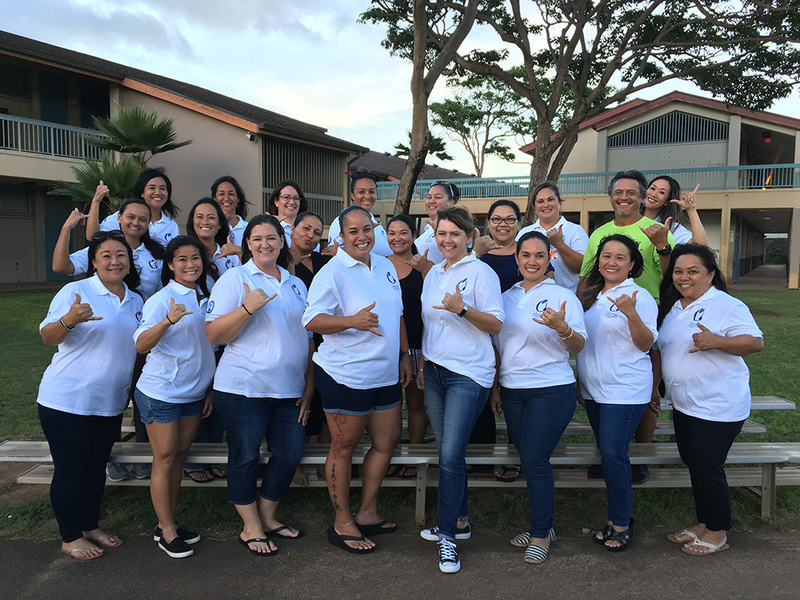 As the mother of two KS students, she feels it is her kuleana to give back to the school and community that has afforded her children so many opportunities. Robin Kealiinohomoku is a 1985 graduate of Kamehameha Kapālama and mother of three children. She is currently working won a Title 9 grant with RCUH, Enhancing Music and Hawaiian Performing Arts at UHMC, and is also involved with developing and mentoring students in the Institute of Hawaiian Music program. She is this yearʻs 6th grade Hoʻolauleʻa 2018 Country Store chairperson. She hopes to develop a strong connections between families and between school and family so our keiki can be enriched by the positive learning and healthy environment they experience in school as well as at home. Dave Takahama has worked at Haiku School for the past 4 years and is currently employed in the KSM High School Science department. He is an assistant coach with the KSM Judo team. Outside of the KSM ʻOhana, he volunteers as Regional Commissioner of Upcountry AYSO soccer, and also coaches a club soccer team; and is an Assistant Scoutmaster with Boy Scout Troop 100 from Kula. Kristy Pang is a teacher and sites Homecoming as a memorable Kamehameha experience. She hopes to establish a better understanding of how class funds are used and learn how the PTSO works within the school. Sienna Yoshida has over 15 years of experience in the financial services industry. She currently specializes in retirement planning and focuses on working with pre-retirees and retirees. Her greatest pride comes from helping local families retire confidently. Sienna is a KSK graduate, active KS Alumni Association member and has served previously on the PTSO Board representing her younger son’s class. Her 2 boys Buster and Sonny are enrolled in KSM grade 4 and 8. Sharolyn Pali is an English teacher at KSM Middle School. A memorable experience for her was co-chairing Ho’olaule’a 2011 Entertainment with her son Tuimana KSM '12. As a Student Co-Chair Tuimana was responsible for securing the Hoʻolauleʻa Entertainment line-up. "I serve on the PTSO Board because I enjoy people and the opportunity to provide service alongside others. I hope to open the lines of communication as a class representative and reach out to all families within our grade level as well as build relationships with others." Kuulei Mashino is a returning parent to KSM, (Kees Mashino, KSM ’06) and Jai Mashino, c/o 2022, enjoys spending time with family, and being a part of school community and volunteering. Is a part of c/o 2022 social committee, and has served as a chair for Country Store in 2016, Non-food chair in 2017, and current Poʻo for 2018 Hoʻolauleʻa. Would like to continue to be of service to our school by serving as PTSO representative. Erin Rodrigues is an Educational Assistant at Makawao Elementary Schools and Assistant Cheer Coach at King Kekaulike High School. Daughter Brynn’s ’16 Rite of Passage was a very memorable Kamehameha experience. "I serve to keep our class updated and to stay involved with my child's academics throughout her years here. I plan to assist families, students, and staff through the upcoming years." Emily Ventura is a Kamehameha parent who enjoys serving in her community through involvement in soccer, church, and at her daughter’s schools. She has filled the roll of PTSO chair multiple times previously as well as class of 2021 Hoʻolauleʻa class chair. She loves to have fun while working and is grateful for all the Kamehameha parents and how much time they invest in the haumāna. Dana Hamasaki is a successful wife of an inspiring husband (Coach Cy), a mother of 4 amazing children (Destiny ‘17, CJ ‘20, Sienna & Mylee), a children’s ministry leader, and co-laborer in the growing family business. Life is always very exciting as Dana continues to look for opportunities to be a blessing to others and to “pay it forward” what has been graciously given to her. Through serving as a PTSO rep for the c/o 2020, Dana hopes to contribute new and fresh ideas while staying true to the Hawaiian and Christian values instilled in our children; and honoring the legacy and mission of Kamehameha Schools. She defines success as helping others to see, to believe, and to achieve! Jamie Palakiko serves as the Student Activities Coordinator for Kamehameha Maui’s Middle and Elementary School Campus. A memorable experience was planning and implementing Project Graduation 2014. Her goal this year is to build a stronger bond for the class of 2020 and to get parents excited to host Ho’olaule’a 2018. Charla Helm works at KSM as an Administrative Coordinator for grades 9 and 10. A most memorable Kamehameha experience was the all school huaka’i to Honolua to welcome the Hōkūleʻa. "I serve on the PTSO board to stay informed about our school and meet and work with wonderful people throughout the school year. In my role, I would like to increase parent involvement, and provide additional opportunities for parents to make a difference." Miki Kubo A memorable Kamehameha memory is making friends with parents when volunteering with class and Hoʻolauleʻa activities. "My goal this year is to communicate with our class families to keep them updated." Aloha e nā makua o Kamehameha Maui! Building strong positive relationships with our keiki and ‘ohana is fundamental to our kula. We practice Hawaiian values of aloha, mālama and kuleana to support these positive relationships. We take the time to develop relationships with each keiki, ‘ohana and staff members work together for the benefit of our students. An active parent is an informed parent, so we hope you visit our Kamehameha Maui Parent Information site often to get the information you need.